This Thai green mango salad is made with an unripened Nam Dok Mai Mango, our premium mango. It's the same mango that you may have enjoyed as dessert along with sticky rice, only not yet ripe. The texture of green mango is crisp and crunchy, and the flavor is sweet but sour, a little like a green apple. It's just amazing when shredded and prepared in a salad like this with toasted nuts, red shallots, green onion, cilantro, and big juicy shrimp. 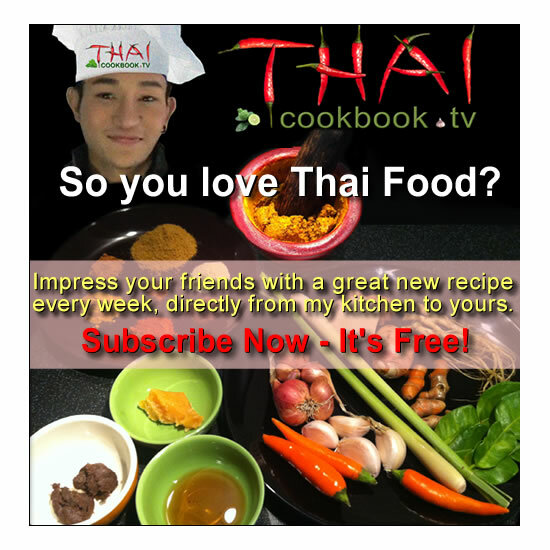 It is normally a little spicy, but you can control just how spicy by limiting the amount of red chili you add. The dressing is a delicious combination of fresh lime, fish sauce, and sugar, giving it a perfect balance between sour, sweet, and salty flavors. What's in our Green Mango Salad with Shrimp. 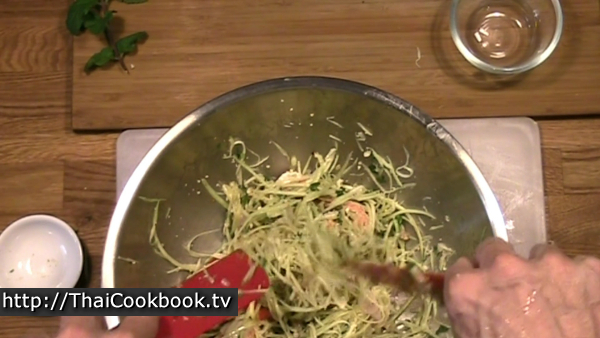 How we make our Green Mango Salad with Shrimp. 1) Toast the nuts in a frying pan. Allow them to cool, then chop them. 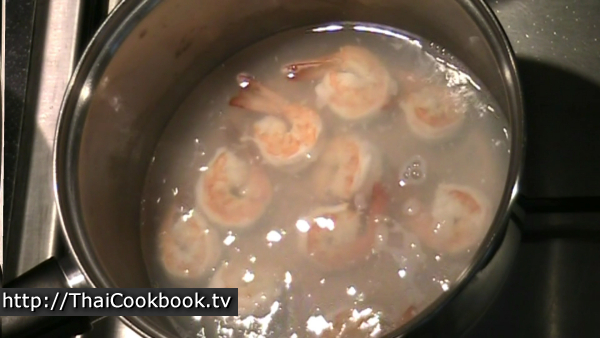 2) Boil the cleaned shrimp for one minute, then cool them in cold water. 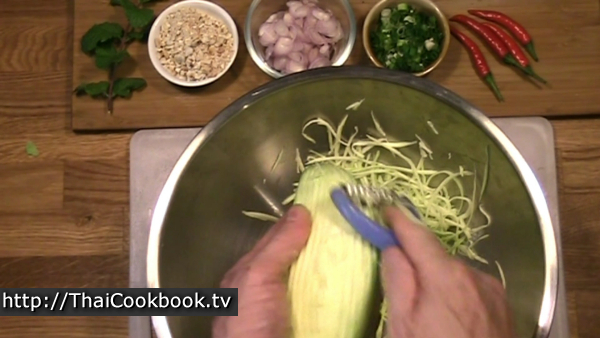 3) Prepare the dressing by whisking the sugar, lime juice, and fish sauce together. Let stand for 15 minutes. 4) Peel and shred the green mango. Chop and slice the shallots, cilantro, green onion. 5) Add hot chili to the dressing, as desired. 6) Toss everything together, then add the dressing and toss up well. 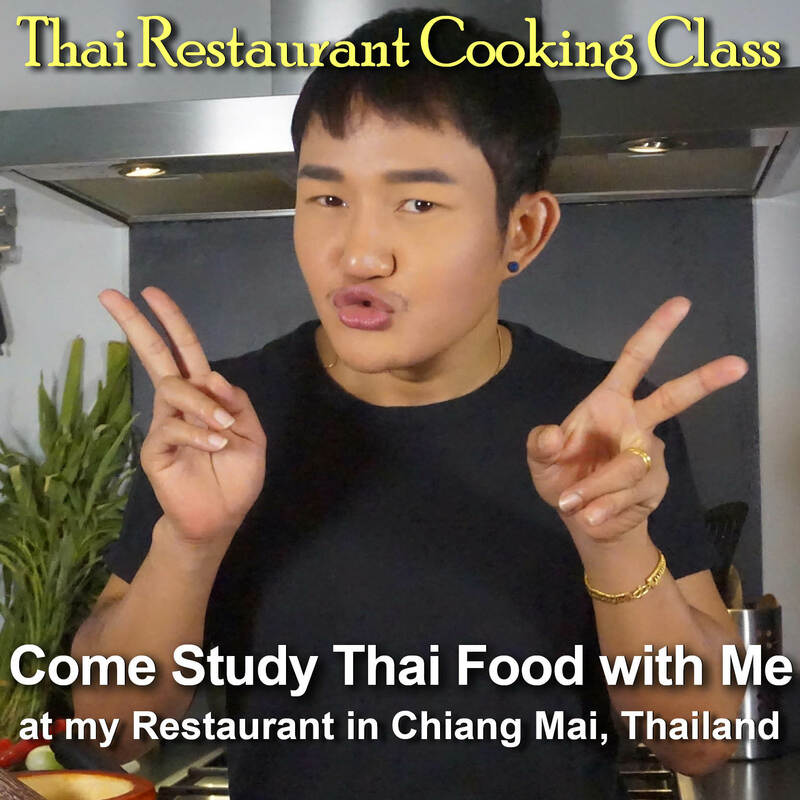 Serve with steamed rice, other foods, or alone as a simple meal. Peel, clean, and devein the shrimp. Squeeze enough fresh limes to get 3 tablespoons of juice. Peel and slice 3 Tablespoons of small red shallots. Chop green onion and cilantro. 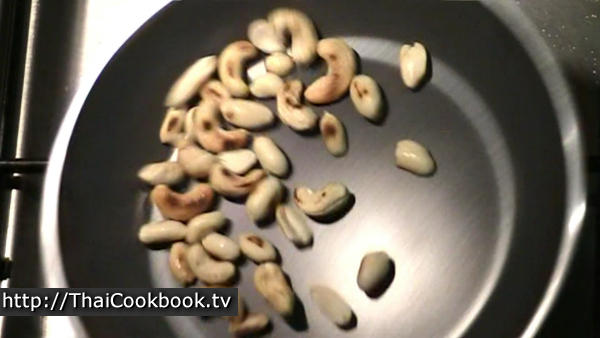 Using a small flat bottomed pan over high heat, toast the nuts for a couple of minutes or until they get brown in some places. Boil some water in small pot. Add the shrimp and cook them until they just turn pink and curl up. About one minute or less is usually enough. Remove them from the hot water quickly and put them in a large bowl of cold water to stop the cooking. 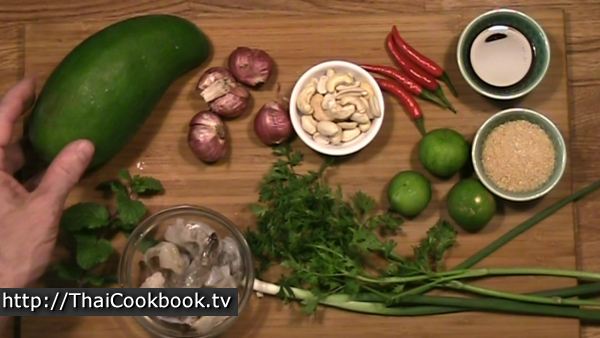 Blend the sugar, lime juice, and fish sauce together. Allow it to sit while you prepare the rest of the ingredients. Be sure the sugar has completely dissolved before tossing the salad. Peel the dark green outer skin from the mango using a potato peeler. Next use a grater to shred the light green fruit into long, thin strips. If you want to have the salad be very spicy, chop the chili very fine. Alternately, you can hit the chilies just a little to break them open and release a little flavor, keeping the chili whole with the seeds inside. This will let a little spiciness out into the salad dressing. 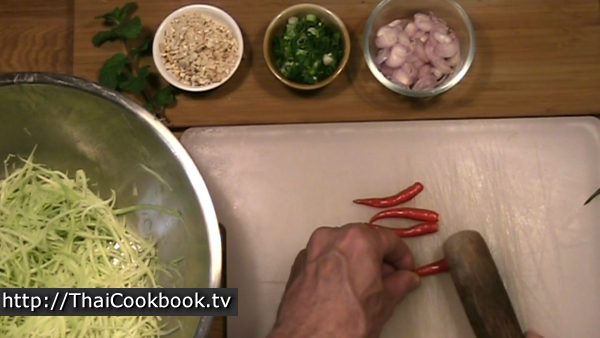 Whether chopped or whole, add the chilies to the salad dressing and stir them in well. Toss everything except the dressing together in large bowl. Once the salad is completely blended and the nuts, shallots, green onion and cilantro are evenly distributed in the shredded mango, then toss in the dressing and mix well. Arrange the salad on a plate big enough to hold it all, to be shared at the table as part of a meal with rice. Garnish with fresh mint leaves.